March 12, 2018 – Our time machine travels back to the Philippines during the Japanese occupation the Second World War. Once in the South Pacific, we’ll bear solemn witness to crimes against women who have been denied the justice and compensation for the atrocities they suffered in the name of the emperor. 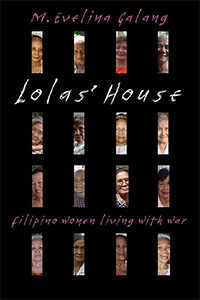 Our guide on this journey is M. Evelina Galang who brings us Lolas’ House: Filipino Women Living with War . The Imperial Japanese Army kidnapped over 1,000 Filipino women and girls, part of a staggering 400,000 women across forced Asia into sexual slavery. Incredibly, and to Japan’s shame, to this day their government denies the crimes of its wartime regime, unlike the heirs of their fascist Axis allies in Germany, where denying the Holocaust is a crime. M. Evelina Galang is the author of several books and the editor of Screaming Monkeys: Critiques of Asian-American Images . She directs the M.F.A. Creative Writing Program at the University of Miami and is core faculty and board member of Voices of Our Nations Arts Foundation (VONA). She wrote the novel, Her Wild American Self , which The New York Times Book Review praised and named a notable book. You can find our guest online at MEvelinaGalang.com, or follow her on Twitter at the handle HerWildAmSelf.